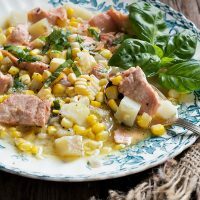 Fresh, dairy-free Summer corn chowder, with fresh corn, potatoes and basil, cooked with a bit of fresh rainbow trout. You can use salmon instead of trout, if you prefer. In a Dutch oven or large pot (or deep skillet), melt butter over medium heat. Add onions and cook, stirring, until softened. Add flour and cook, stirring, for about 1 minute. Add chicken broth and potatoes. Increase heat to medium high and bring mixture to a boil. Reduce heat to medium low and simmer, uncovered, stirring once or twice, for about 5 minutes. Add corn kernels and simmer, until potatoes are just tender. When potatoes are tender, place trout pieces on top of chowder. Cover and cook until fish is just cooked, about 3-5 minutes, depending on thickness. Taste and season with salt and pepper, to taste. Spoon in to bowls. Garnish with chopped fresh basil and additional fresh corn kernels. Note: If you would like a creamier soup, you can add a touch of cream at the end. For a thicker soup, remove a bit of the soup, puree and add back in.